When they were leaving the world premiere of G. W. Pabst's film "Pandora's Box" (1928), Louise Brooks could hear her name in the crowd around her, but she didn't like the tone they were using. She asked Pabst what they were saying. He translated: "She doesn't act. She does nothing." This perhaps delighted the great German director, who also chose Brooks to star in his next film, "The Diary of a Lost Girl" (1929). In her autobiographyLulu in Hollywood,one of the most charming and honest books about the movies ever written, Brooks says Pabst refused to discuss the details of a performance with her and never held group discussions with his actors: "He wanted the shocks of life to release unpredictable emotions." Nor did he encourage his actors to associate with one another. "Every actor has a natural animosity toward every other actor, present or absent, living or dead," she writes, and Pabst used that tension to enhance the emotions in a scene. She tells another story. In the scenes in their films where Brooks wears thin dresses or nightgowns while dancing with an actor, he forbid her to wear anything under them. "No one will know," she told him. "The actor will know," he said. In not acting, in "doing nothing," Louise Brooks became one of the most modern and effective of actors, projecting a presence that could be startling. Among those who know the movies, It might be true to say that Brooks is one actor who still, to this day, inspires deep affection. She is so simple, so direct, sothere.Watching her fourth-billed in "The Show-Off" (1926), I watched her effortlessly steal every scene she was in. The others were there in front of the camera. She seemed actually in the scenes. I don't mean to suggest that in "not acting" Brooks was wooden or robotic. There was no doubt when she was expressing sadness, happiness, enthusiasm, fear. But she suggested an unusual degree of self-possession; in the middle of a happy scene, the others might act out mirth, but her reaction would be more one of regarding it, recognizing it. Her job as an actress wasn't to lead us in the proper reaction. It was to observe its reality. Fancy hair styles were not for her. She had that crisp pageboy bob that Vidal Sassoon pilfered 25 years later. She had those strong, straight eyebrows, unlike the coy arches of her contemporaries. She was so slender and fit she seemed poised for flight. The most extraordinary things happened to her in her best films, and instead of visibly reacting and telegraphing emotions, she acted as the instrument to transmit them to us. She encourages identification to an unusual degree. By 1928 she was one of the best known movie stars in the world, but she was fed up with Hollywood and too smart for the way the industry treated actresses. She was brought to Berlin by Pabst, who was tired of overeager actresses; he had worked in 1925 with Greta Garbo, another restrained performer. Together they made two of the greatest of silent films. They were both scandalous for their portrayals of lesbianism and prostitution, and after returning to Hollywood she offended the sensibilities of a company town by turning down the lead in "Public Enemy" opposite James Cagney. She made several unsuccessful films in the 1930s, and then, she writes in her book, "I found that the only well-paying career open to me, as an unsuccessful actress of thirty-six, was that of a call girl." One of her clients was William S. Paley, the founder of CBS, who sent her a check every month for the rest of her life. The French film critics rediscovered her; as often, they were ten years early in telling Americans what was best about our movies. In its article Wikipedia quotes Henri Langois, founder of the Cinematheque François and the great influence of the auteur school: "There is no Garbo, there is no Dietrich, there is only Louise Brooks!" It is well known that James Card, film curator for George Eastman House, found her in New York in the late 1950s, bonded with her, brought her to live in Rochester, encouraged the writing ofLulu in Hollywood,and launched the second life of her career. He found her "living as a recluse," Wikipedia says, but because of Paley's loyalty she was not precisely on Skid Row. A veteran film publicist named John Springer told me: "At a dinner party at my house one night, Card said he would give anything to find Louise Brooks. I told him he might not have to look too hard: She had the apartment across the hall." 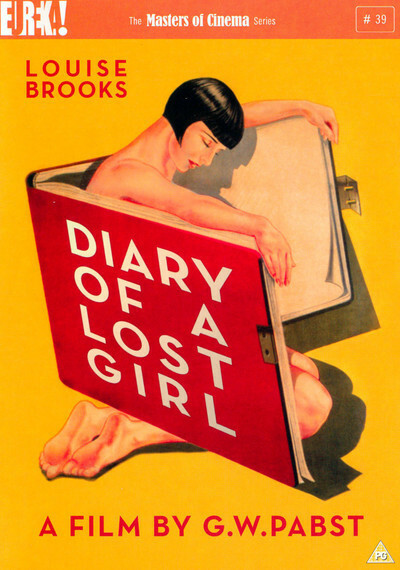 "Diary of a Lost Girl" was the close of her glory days. It's not the equal of "Pandora's Box," but her performance is on the same high level. It has a frankness that would largely disappear from mainstream films after the rise of censorship in the early 1930s. She plays Thymian, an innocent young girl we meet on the day of her First Communion. Her family lives upstairs over her father's drug store, which is managed by a man named Meinert (the actor Fritz Rasp has a lupine face and cruel smile). It is revealed that her father has made the family's young maid pregnant, and she is thrown from the house. The next maid, Meta, observes that the father can be seduced, and efficiently does so. Thymian feels shut out at home as her father and Meta start a new family. She becomes pregnant by Meinert, and the scandal is too great for the bourgeois family; after her child's birth Thymian is sent to a cruel "reformatory" run by a sadistic lesbian taskmaster of a woman and her towering, shaven-headed husband. Running away with another girl, she finds her way to a whorehouse, where the grandmotherly madam makes it clear what Thymian's duties will now consist of. One of the clients is Count Osdorff, an old friend of her family and a wastrel whose half-hearted attempts to help the girl come to nothing. In an ending of unrestrained irony, Osrorff's wealthy uncle marries Thymian, who now becomes a member of Society for the Rescue of Endangered Female Youth. The Society pays a visit on the whorehouse, where Thymian attempts to play the reformer role expected of her, but finally rises up in wrath. One notable element of the film is that it's entirely the story of Thymian, just as "Pandora's Box" was entirely the story of Lulu. Louise Brooks didn't have a personality or screen presence that lent itself to supporting roles. If both young women are victims, neither is helpless, and the men who would exploit her find their evil turned against them. In a world of cruelty, the Brooks characters stand as enduring figures. How she accomplishes this is the mystery of her acting. "The great art of films," she wrote, "does not consist of descriptive movement of face and body but in the movements of thought and soul transmitted in a kind of intense isolation." Also in my Great Movies Collection: "Pandora's Box."